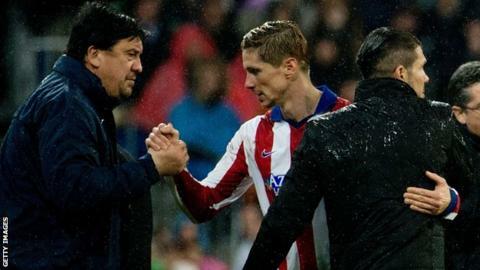 Atletico Madrid boss Diego Simeone says Fernando Torres has returned "a man" after the striker scored his first goals since rejoining the club. The Spain international, 30, left his boyhood team for Liverpool in 2007. He re-signed for Atletico earlier this month and scored twice in Thursday's 2-2 draw at the Bernabeu as his side reached the Copa del Rey quarter-finals with a 4-2 aggregate win. "He left, matured and is now a man," said Simeone. "I am very pleased for him. The fans are happy and his arrival has been good for us even though some had their doubts." Torres scored 84 goals in 214 league appearances for Atletico from 2001-2007, before spells at Liverpool, Chelsea and AC Milan in a career that has brought him success in the Champions League, FA Cup, World Cup and European Championship. After signing on loan from AC Milan until the end of next season, 45,000 fans attended his official unveiling at Vicente Calderon Stadium. Torres had never scored at the Bernabeu in his first spell at Atletico, and his brace was also his first in any club competition since 2013. His goals - both clinical finishes - came in the first minute of each half. "It's been a beautiful day. A day to enjoy," said Torres. "I'm happy for the people who came, to score my first two goals in this homecoming and in a stadium in which I hadn't scored yet."